Yard signs are a great way to advertise your business! 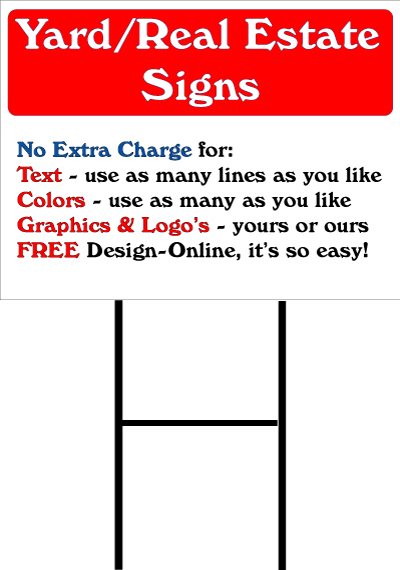 Yard signs get seen by thousands of potential customers every week. They prompt your potential new customers to take action and pick up their cell phone to call. This is an extremely cost effective way to promote your business. Yard signs are made using a outdoor weather resistant, ridged, corrugated (fluted) plastic that looks great and can last for many months of outdoor exposure. No extra charge for multiple colors and/or stock graphics. If you are in need of campaign signs this year please take a look at out services and prices. On full color signs (including photos) we are extremely completive and can produce them for the price most charge for two color signs. I would be happy to design your signs for you. If you are interested please reply back to this email and tell me the information you want on your signs. I will then produce a few examples and send them to you... and it's free of charge.